Forming tools are used to apply considerable force to metal and other materials in order to alter the material to the desired shape. Forming is a very effective method of materials processing. When used in mass production in which the same processes are repeated, material losses are kept low, and so it can significantly reduce cost and processing time. It is also kinder to the environment as only minimal amount of carbon dioxide are produced. In recent years, users have been demanding metal molds that are have excellent function, quality, and can be installed quickly and inexpensively. It is essential to respond to the increasing complexity of metal molds and achieve a general reduction in costs using metal lathes. Against such a backdrop, Chuo Koki has a rich array of tools necessary for Forming, including forging, stamping, extrusion, rolling, and drawing. We collaborate with many plastic working tools manufacturers, enabling us to provide a wide variety of such tools. 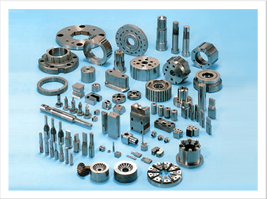 We have deliver high-precision processing while keeping down the cost of the tools. Considering to the quality, price, and lead time our customers, we select the manufacturers that best matche such criteria, provide the most up-to-date information and PR, and thereby provide a specialist and comprehensive metal mold plan, which includes a maintenance service. We consider the service we provide to be our greatest strength, as well as our duty.